The government shutdown doesn’t just hurt the 800,000 employees in affected federal agencies. Businesses who do contracting work for the government are feeling the pinch, too. 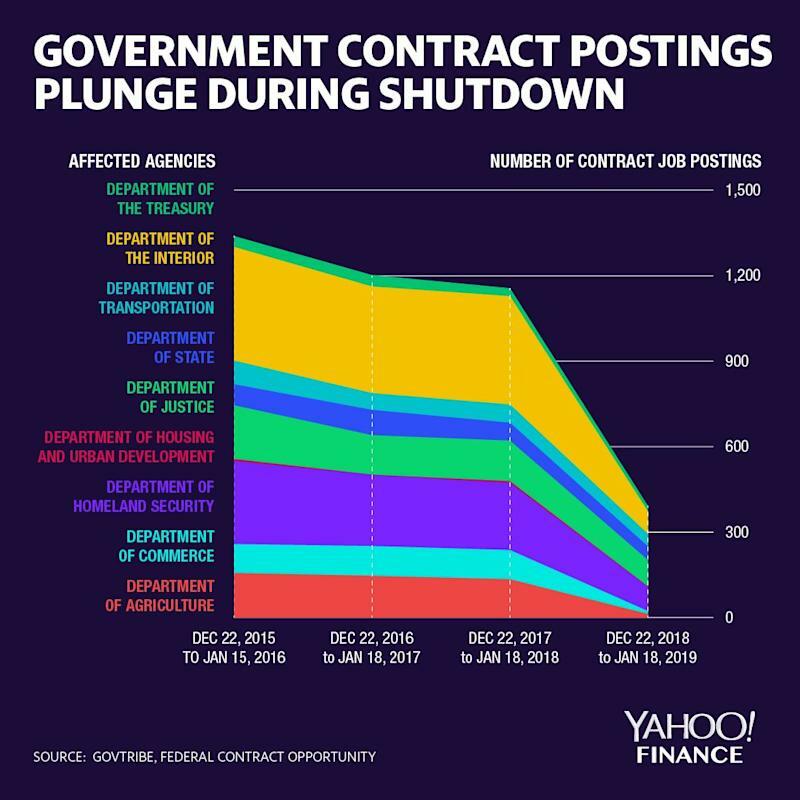 The number of contract postings in the Federal Contracting Opportunities system has plunged during the shutdown, which began December 22, according to data from GovTribe, a platform tracking federal contracting information. Since the shutdown, nine affected agencies posted 392 contracting opportunities, only one-third of last year’s postings during the same time period. The U.S. Department of Agriculture and Department of Commerce got hit by the funding lapse — both agencies posted just 10% of last year’s contract opportunities. The value of contracts awarded during the period one year ago was worth more than $3.7 billion, but this year the contracts reported so far are only worth $1.8 billion. This means contractors have fewer work opportunities and are losing out on revenue. Aside from working with big corporations like Lockheed Martin ( LMT ) and small businesses, the federal government has become reliant on private contractors to implement tasks. Paul Light, a professor at New York University, estimates there were 2.6 contract or grant employees for each federal employee as of 2015. Joe Scirica, a retiree in Atlanta, has been taking three contract jobs with ISN Corporation, a services provider to federal government agencies. Two of those jobs have been discontinued due to the lack of government funding, which means his monthly income has been cut by $500 to $1000. “I lost my gas money job,” said Scirica. “The money I used to count on isn’t coming in any more”. It remains to be seen how the drop in contracting positions will affect the upcoming January job report. Omair Sharif, senior U.S. economist at Societe Generale, thinks it’s likely to be a modest drag in the order of around 10,000 and the unemployment rate could also be pushed down by about 0.2 percentage point. By the first week of January, the initial claims for Unemployment Compensation for Federal Employees (UCFE) remained at a low level compared with the brief government shutdown in 2017. Krystal Hu covers technology and trade for Yahoo Finance. Follow her on Twitter .